So many thoughts, so many feels. I realize the irony in this Pin, trust me I do. What does a girl with (currently, can change at any time) 3,674 Instagram posts, 9,797 Tweets, and countless FB posts have any business posting something like this? Because it resonates wholeheartedly with me. I know life happens in between posts and tweets. I know life is messy, happy, ugly, hard, sad, and frustrating. Life is even beyond those few adjectives I just listed. Trust me, the last three weeks I’ve felt every damn adjective in the book of life! That does NOT mean that I don’t understand what this image is trying to say. I chose to share my life with you (and the whole world, since most of my SM is public most of the time…oh and this little blog I have too), but I know that I don’t have to post something to know that it happened or elicited an emotion from me, good or bad. 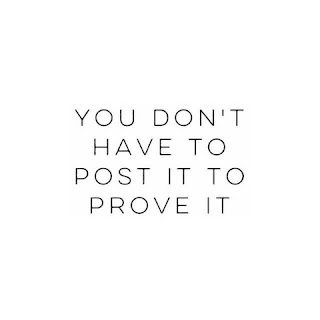 This reminds me of a saying that is used frequently, “Pics or your lying.” Both make me smile, because in essence all we really want to do is live our lives. Take the selfies. Post the quotes. Post the kid pics. Post the pet pics. Write the blog posts. Write the Yelp reviews. Be mad when you’re mad. Don’t pretend to like something. Eat the good food. Skip the workouts. Take a sick day when you just need a day off. Skip the chores. Drink the wine. Parent how you see fit. Say NO when you don’t want to do something. But do it all on YOUR own damn terms. It is true, our lives are subjected to so much scrutiny, because we share more of it than we ever did. There are those that don’t share it all, but I’m sure they receive scrutiny in different ways. Not that the scrutiny is welcomed or warranted, which means we have to receive it as is and keep on going on about our lives as we want to live them. So, yes. I know life happens even if I don’t post it. I enjoy sharing delicious foods with you, a smiling selfie with you, my workouts with you, my runs with you, my fun times with you. I just like to share my life and I see no problem with that. For those that do, then I respect your decision to keep those moments private and not post them, I have no opinion on that. But what I do have an opinion about is when you judge others who do as you do not. Mind your own business. Letting me do what makes me happy is none of your business. You either follow along for the journey or don’t, either way I’m keepin’ on as I please! Yes, life happens between the posts and even when something isn’t posted. I’m sure there are times when I have posted a selfie because I needed some loving from others and my self esteem may have been low. I’m human. Other times, I may have just wanted to share my smile. I don’t think its narcissistic, it’s just me being me. I get that its not everyone’s style and I don’t blame them for that. If we were all the same, then life would be boring!